New research shows wild bees are essential for producing larger and better blueberry yields -- with plumper, faster-ripening berries.The study is the first to show that wild bees improve not only blueberry quantities, but also size and other quality factors. Their benefits include: greater berry size (12 percent), quantity (12 percent), size consistency (11 percent), and earlier harvests -- by two and a half days. Credit: No credit required. Want bigger, faster-growing blueberries? New research shows wild bees are an essential secret ingredient in larger and better blueberry yields—producing plumper, faster-ripening berries. 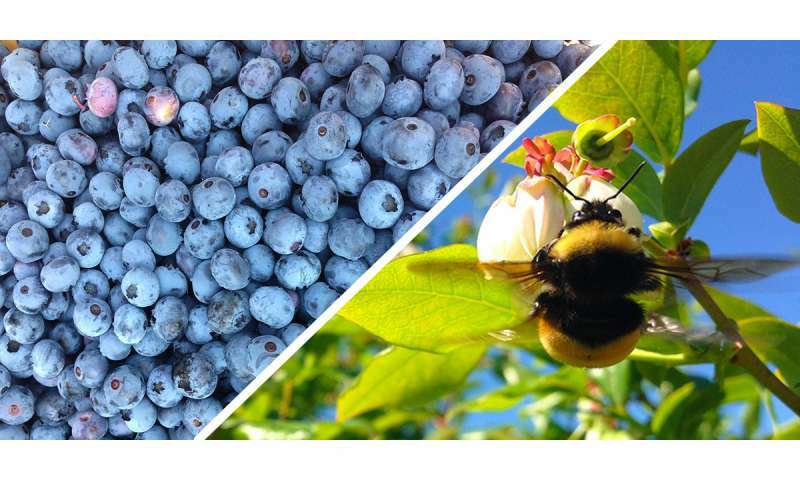 The study, led by University of Vermont scientists, is the first to successfully reveal that wild bees improve not only blueberry quantities, but also size and other quality factors. 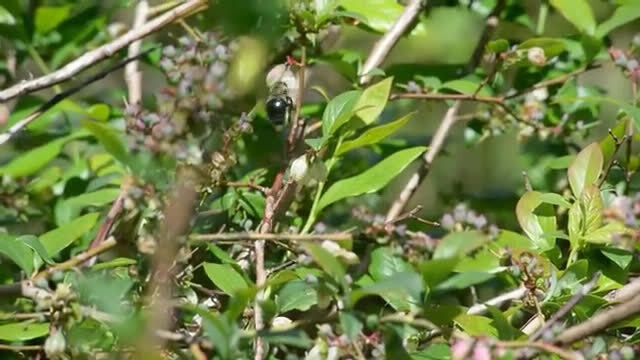 It finds that wild bees provide major benefits for berry farmers, including: greater berry size (12%), quantity (12%), size consistency (11%), and earlier harvests—by two and a half days. "Other studies have explored bees' effects on blueberry yields, but this is the first to show that pollinators can improve the quality of crops as well," says Charles Nicholson, who led the study as a Ph.D. student in UVM's Gund Institute for Environment and Rubenstein School of Environment and Natural Resources. The study is published in Agriculture, Ecosystems and Environment. Of the nine berry farms studied across the state of Vermont, the researchers calculated that wild bees could boost production up to 36%, or roughly $136,000 per year, on one mid-sized berry farm alone. On other farms, researchers determined wild bees' potential benefits to production as roughly 6% on average. "This study highlights the undervalued work that wild bees do," says Nicholson, noting that two-thirds of the world's most important crops benefit from bee pollination, including coffee, cacao (for chocolate) and many fruits and vegetables. "Without them farmers need to find pollination somewhere else, by paying high rental fees to bring in honeybees, for example." The findings offer a farm-scale perspective to recent global estimates of wild bees' economic benefits in the billions, annually—roughly equal to that of honeybees, with less associated costs. Because honeybees visit Vermont blueberries much less often than in other blueberry growing regions, the Green Mountain State is a perfect location to isolate the value of wild bees to berry farmers, researchers say. "Most pollination research occurs in regions awash in honeybees," says co-author Taylor Ricketts, Director of UVM's Gund Institute for Environment. "That makes it difficult to really see the job that wild bees can do for farmers." The team painstakingly hand-pollinated blueberry plants in all nine research sites—using electric toothbrushes to mimic the buzz pollination of bumblebees, and then painted the collected pollen on over blueberry 5,000 flowers with small brushes. They compared production on these flowers, which received near-perfect pollination, to the naturally pollinated branches. The difference between the two conditions revealed each farm's "pollination deficit", the amount by which production could be improved with an increase in wild pollinators. "Many farmers don't realize they can be limited by not enough pollinators just like they can be limited by water or nutrients," says Nicholson. This study highlights the importance of wild bees to global agriculture, yet the first study to map wild bees across the U.S. - by Ricketts and colleagues—suggests wild bees declined in abundance by 23% between 2008 and 2013, especially in key U.S. agricultural areas. Another Ricketts study recently found that climate change could reduce areas available for coffee production by 88% in Latin America, as well as the bees numbers available to pollinate coffee. Another reason to protect wild pollinators—for berry lovers, at least—is that wild bees, especially bumblebees, are better at pollinating blueberries than honeybees. Bumblebees have evolved the ability to "buzz pollinate," vibrating blueberry flowers at a specific frequency to efficiently release showers of pollen. Honeybees are unable to do this, and must instead use less effective techniques to pry pollen from the flower. What can farmers and policymakers do to protect wild bees? The UVM team has found that maintaining a high proportion of natural bee habitat around farms can help, as well as spraying less pesticides. Small actions by homeowners can help too, such as mowing less, planting native wildflowers, and putting out 'beeboxes,' which are like birdhouses, but for wild native bees. "This study shows, yet again, that protecting wild bee populations offers important benefits to our agricultural economy," adds Ricketts. "Maintaining healthy ecosystems can be as important as providing fertilizer or water."